last few days have been really good this side with some blue water patches amonst all the green water deep off V and VI mile where we have been finding some nice Marlin and loads of yellowfin action. We caught Marlin 3 days in a row and lost some decent fish up to 800 lbs but let me tell you about the monster sailie we got. before going down and sulking. We put on the heat with the drag at 40 pounds and eventually got the fish up a second time and as it trashed on the surface it spit the bait which was probably in it’s stomach all the time – sure the circle had never found the corner. Twenty minutes of fun. By noon things had gone a bit slow and we worked the top end of II mile hoping for another bait when one of the bait rods go, but this time a massive sailfish jumped on our stern. Really nice big fish that put on a tremendous fight on the light rod. Unfortunetly the fish was gut hooked and totally spent by the time it got to the boat and could not be revived. It weighted a whopping 58 kg. We finished the day up north where we once again found some fast yellowfin tuna action up north and ended a great day with a Black Marlin release about 200 pounds. 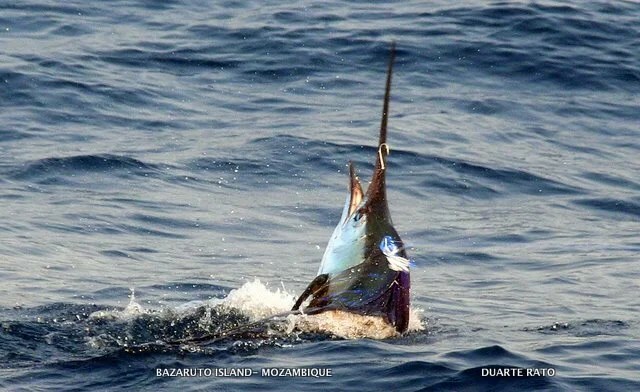 The boys went 1 for 2 on Black Marlin yesterday. After a morning of game fishing they put a bonito live bait out off V mile which was taken by a nice fish about 700 lbs that pulled the hooks after 20 minutes. 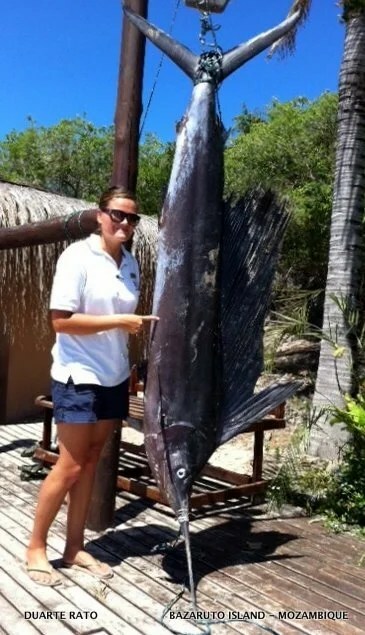 Then they caught a sailfish at II mile that unfortunately was gut hooked and died, it went a whopping 58 kg (128 lbs). Fishing in the lighthouse area in the afternoon they released a Black around 200 lbs.